When Guatemalan President Otto Pérez Molina (right) first came to power just over a year ago, he promised to govern the country with a mano dura, an iron fist. After years of Mexican drug cartels muscling their way across the border into Guatemala and Central America, it seemed as though the former army general had inherited a nation on its knees. The word on voters’ lips was ‘security’ and he assured them he would deliver: increasing the army to fight drug trafficking and secure the country’s borders. About 90 per cent of the cocaine entering North America every year passes through Central America, according to the UN’s International Narcotics Control Board, costing Guatemala billions of dollars and thousands of lives each year. However, it wasn’t always like this. Up until fairly recently, the large majority of Latin American-grown drugs was transported to the US by plane or boat. But the ‘war on drugs’ shifted the problem inland, which left Guatemala caught in the crossfire between illegal narcotic-producing countries in the south and illegal narcotic consumers in the north. 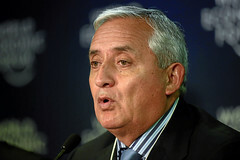 Due to his previous job as head of military intelligence, Otto Pérez Molina has been at the forefront of his country’s drug war for more than 20 years. Now, after more than 12 months in power, has his government had any success at reducing drug trafficking? Soon after taking office in January 2012, the Guatemalan President approved the creation of two new military bases in the country, upgraded a third and made it a priority to reinstate a longstanding ban on US military aid to Guatemala – a controversial move since the aid was stopped over concerns regarding abuses during the country’s civil war. In late August 2012 around 200 US Marines arrived in Guatemala as part of Operation Martillo, an international mission aimed at intercepting illegal narcotics, bulk cash and weapons being transported along Central America’s isthmus. Operation Martillo has divided the public: some see it as a great success, but others disagree. ‘There may be a few arrests, and there will be continuing military operations carried out in various regions of the country, in the name of fighting narco-trafficking, but there will be no fundamental changes in terms of the flow of drugs north,’ says Graham Russell from the Human Rights NGO Rights Action that works in Guatemala. In addition to his involvement in the US-led mission, the Guatemalan President ruffled a few feathers when he became the first head of state to suggest legalizing drugs. The controversial proposal provoked strong criticism from the US, as well as intense debate within Guatemala. However, it succeeded in getting the international community to discuss Latin America’s drug problem, which many believe was his objective. During a recent press conference at the World Economic Forum in Davos, Switzerland, the rightwing general appealed to world leaders for a new approach to regulating the drugs market – stating that the current method was not working. After spending more than a year fighting against drug trafficking on land and at sea, it seems the Guatemalan President’s new approach to the ‘war on drugs’ is to urge the international community to help tackle the problem that their consumption fuels. But when the countries caught in the crossfire are on the other side of the world, it is all too easy to turn a blind eye.